For manyorganizations, Hadoop is the first step for dealing with massive amounts ofdata. The next step? Processing and analyzing datasets with the Apache Pigscripting platform. With Pig, you can batch-process data without having tocreate a full-fledged application, making it easy to experiment with new datasets. Updated with usecases and programming examples, this second edition is the ideal learning toolfor new and experienced users alike. You’ll find comprehensive coverage on keyfeatures such as the Pig Latin scripting language and the Grunt shell. 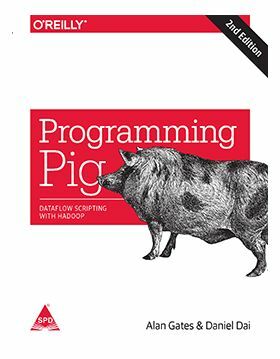 When youneed to analyze terabytes of data, this book shows you how to do it efficientlywith Pig. Alan is co-founderof Hortonworks and an original member of the engineering team that took Pigfrom a Yahoo! Labs research project to a successful Apache open source project.Alan also designed HCatalog and guided its adoption as an Apache Incubator project.Alan has a BS in Mathematics from Oregon State University and a MA in Theologyfrom Fuller Theological Seminary. Daniel is an ApachePig PMC member/committer involved with Pig for 6 years at Yahoo and now atHortonworks. He has a PhD in Computer Science from University of CentralFlorida, with a specialization in distributed computing, data mining andcomputer security.